This is our 42nd Rotary Ball Year and the theme is "The Titanic" and this year we will be rocking with the band The Salamanders. - WITH NOON ROTARY CLUB PROVIDE GRANTS TO CCSD TITLE 1 SCHOOLS FOR ASSISTING FAMILIES WITH HYGIENE, FOOD AND PERSONAL NEEDS. Along with many other projects & help throughout the community. Tickets are available NOW for this year so get yours before they are sold out! The main event ticket price is ONLY $250 and gets you dinner for two and into the grand prize raffle of $20,000, 2nd prize of $5,000 or 3rd prize of $1,000 . Also, every 40th ticket drawn will receive $40. The Big 50 raffle is an additional $100 for a chance at $5,000! So for a combined ticket price of $350 you could potentially win $25,000! We like to give a Special Thank You to our 42nd Annual Main Event Sponsors WHITE'S ENERGY MOTORS & EARTHWORK SOLUTIONS along with a Thank You to all that are additional sponsors for this year's 42nd Annual Event. 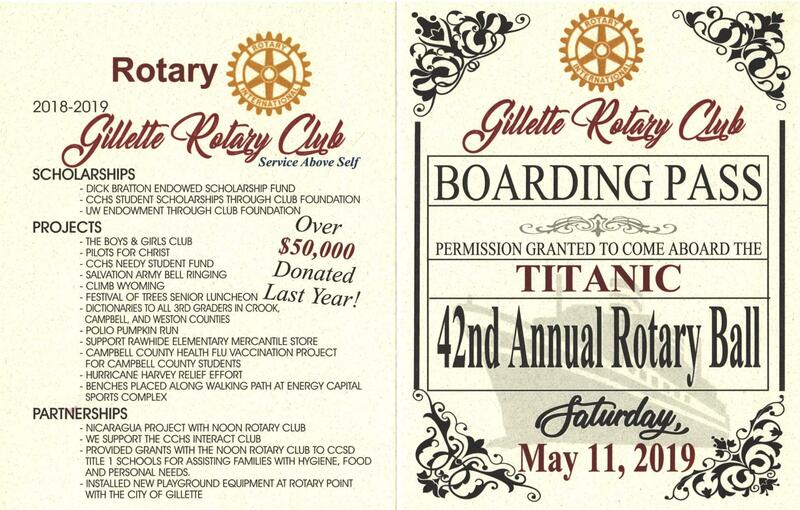 Tickets are on sale NOWand can be purchased from local Rotarian's, by CLICKING HERE TO CONTACT US ELECTRONICALLY or by contacting the 2019 Rotary Ball Chairman - Mark Wagner @ 307 680 2625. Tickets can also be purchased ONLINE HERE! We look forward to seeing you there! Thanks for your support.